Nick Giambruno’s Note: Regular readers know I’m a strong advocate of international diversification—such as holding multiple passports and offshore assets. It frees you from absolute dependence on any one country, which minimizes the State’s power to coerce you. Last month, I shared an essay that explains why bitcoin is a critical part of this strategy. It’s an inherently international asset. And governments can’t freeze, seize, or block bitcoin transactions. But a lot of people don’t know much about the technology that makes bitcoin—and other cryptocurrencies—such a disruptive international diversification tool. On March 10, 2000, the Nasdaq Composite Index closed at what was then an all-time high of 5,048. It was the height of the dot-com bubble. Bolstered by the potential applications of the internet, technology companies were seeing unprecedented returns. On December 16, 1998, Henry Blodget, head of the global internet research team at Merrill Lynch, predicted that Amazon, which was trading below $250, would hit $400 within a year. The company shot past $400 within two weeks. A young tech company called VA Linux Systems went public on December 9, 1999. The stock climbed 698% in one day. I could go on and on. But we all know how it ended. In late March 2000, the Nasdaq began a momentous crash. The index fell 78% in the next 30 months. Roughly $5 trillion in market capitalization was lost. It was, and remains, one of the worst market crashes in history. Within a matter of hours, we’ll see a buying frenzy that sparks an ascent to $10,000 gold. But you must take action now, and specifically on one obscure gold trade. Click here for the full story. I don’t bring this up to worry you or to open old wounds. I simply want to provide some context for another situation that we are presented with today. There are certainly some stark parallels between the internet boom and what is happening right now in another asset class. Much of the speculation during the internet bubble was caused by runaway optimism for how the internet would transform business and the world. Combine this with speculators who wanted to “get in on the action” and you had the makings of an asset bubble of epic proportions. Today, we face a similar situation. An industry-altering technology with nearly limitless applications has burst onto the scene. And just like the dot-com bubble, assets associated with this technology are soaring. The technology I’m referring to is the blockchain, the decentralized ledger technology underpinning most cryptocurrencies. The assets that are soaring are digital tokens, digital coins, cryptocurrencies, and the companies behind them. I’ll be the first to say it, the run-up in many cryptocurrencies this year has been nothing short of spectacular. Bitcoin, at the time of writing, is up more than 1,669% since January 1 of this year, and Ethereum is up about 9,803% during that same window. Money… and a lot of it. 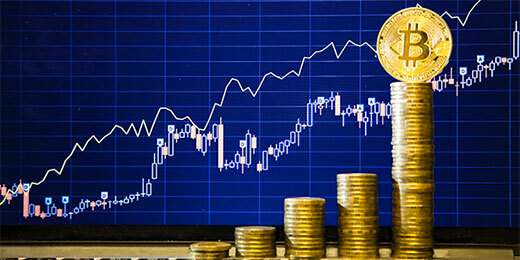 More specifically, as industry, enterprise, financial institutions, and even governments began to discover the immense potential of distributed-ledger technology and the kinds of applications that can be deployed on blockchains, the financial world took notice. And that has driven billions of dollars of private capital into the new asset class of cryptocurrencies. And yes, cryptocurrencies and digital tokens are quickly becoming their own asset class. That will lead to even more money flowing into this investment class. The Bitcoin bull market will go down in history – but DON'T WORRY if you didn’t get rich. Because the second megaboom will be MUCH BIGGER. In fact, it will DWARF anything we’ve seen, minting a whole new class of crypto millionaires. Will you join them? And if one needed more evidence of the readily available capital for the cryptocurrency and blockchain markets, look no further than what is happening with initial coin offerings (ICOs). ICOs are analogous to IPOs (initial public offerings) in that they are a way to raise capital to be used in growing a business. One important distinction, though, is that in an IPO, an investor receives shares in the company, actual equity. In an ICO, an investor receives no equity at all, just the cryptocurrency (or digital token) that the company is issuing in the ICO. 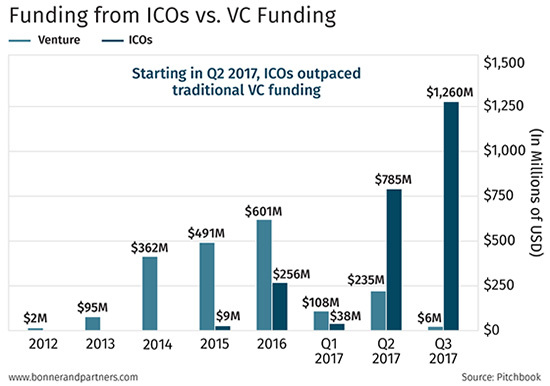 Capital raised by ICOs slowly started to increase throughout 2016, and by the third quarter of this year, funding raised by ICOs exceeded funding raised through traditional venture capital channels. In fact, in 2017, blockchain-related companies raised only $349 million via venture capital channels, compared to more than $2 billion via ICOs. That’s almost six times more via ICOs versus venture capital. All in the span of seven quarters. Unbelievable. And here is the kicker: Almost every single one will fail. A recent study showed that less than 9% of blockchain-related companies that issued their own cryptocurrency are actually using those cryptocurrencies in running their networks. Investors who do not understand the underlying technology, the utility of the specific blockchain and/or application, and the credibility of the founders and management team are just gambling. The odds are worse than early-stage venture capital investing, which sees anywhere between 80% to 90% of all companies failing. But if investors can take the time to get educated and differentiate between the credible deals with great utility and the bad ones, it is possible to stack the odds in your favor. And it is not too late. It is most certainly not too late. In the late ’90s, runaway optimism for internet technology created a bubble, and crash, of epic proportions. But here’s the thing… the internet DID revolutionize the world. We already know this. The way we communicate, conduct business, work, transact, and even shop changed dramatically. While some companies like Pets.com and Webvan failed completely during the market crash, other companies like eBay and Amazon did fulfill on their visions. eBay is up 5,303% since October of 1998. Amazon is up more than 76,978% since June of 1997. Blockchain technology will revolutionize the world the way internet technology has over the last 20 years. I would argue that the impact will be even more profound than what we experienced with the internet. But along the way, we will undoubtedly experience some pullbacks. I recommend taking the time to educate yourself and invest in cryptocurrencies that are solving real-world problems. These will be your safest way to profit from the blockchain revolution. By focusing on assets that provide invaluable utility, you’ll position yourself to profit as blockchain technology transforms entire industries. Nick Giambruno’s Note: Jeff’s convinced blockchain technology will revolutionize our society the way the internet did more than 20 years ago. He says smart investors stand to make 21 times their money over the next few years. But 99% of investors are so distracted with bitcoin they’re missing the bigger picture. Jeff’s uncovered three ways to profit safely from the blockchain explosion without ever downloading a digital wallet or logging onto a cryptocurrency exchange. Click here to see how. P.S. Blockchain technology will revolutionize our society the way the internet did more than 20 years ago. Smart investors stand to make 21 times their money over the next few years. But 99% of investors are so distracted with bitcoin they’re missing the bigger picture. I’ve uncovered three ways to profit safely from the blockchain explosion without ever downloading a digital wallet or logging onto a cryptocurrency exchange. Click here to see how.